Inspect seed samples for purity using your choice of optical systems — a Mantis Inspection Magnifier, a Stereo Microscope or a Video Camera. Our Ergo Station and Ergo Vision Systems delivers greater productivity with less operator fatigue. Adjustable speed Syntron™ Vibratory Feeder moves the seeds through the field of view. 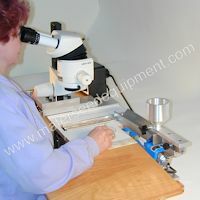 Interchangeable Inspection Trays for rapid setup for different seeds. Fixed Mounting Plate for Leica MZ or GZ Series Microscopes. Purchase focus drive and microscope from your Leica dealer. Dual Feeders: Dual Syntron™ Vibratory Feeders with Mater Dual Feeder Controller. Standard Sizes: 0.38in (10 mm) to 2.00 in (51 mm) wide by 0.25 in (6.4 mm) deep.